Korea’s Ministry of Labor denied the registration of the Korean Government Employees' Union on March 6, for the third time in three month. Not just for KGEU, the ministry ordered the Korean Construction Workers’ Union (KCWU) to revise their union establishment report, and the Korean Transport Workers’ Union (KTWU) and Korean Teachers and Education Workers' Union (KTU) got such orders, too. Almost half the members of the KCTU are about to be illegalized. Labor rights constitute the essence of democracy. The Korean government’s plot to destroy labor unions is, therefore, an attempt to tramp the democratic constitution. In this sense, the KCTU’s struggle is not just for protecting union members’ rights but also for reviving the suffocated democracy throughout the society. The KCTU set 2010 major action plans and directives in a recent the Central Executive Committee meeting. The KCTU has set maximizing negotiating power through powerful struggle as the main objective for 2010. That explains why it has decided to participate in the Time-off System Deliberation Council, while the Korean Railway Workers Union, the Korea Cargo Transport Workers' Union, the Korean Construction Workers’ Union and other major organizations determined to unfold an all-out struggle, which includes a general strike. The Korea Metal Workers’ Union has also decided to mobilize support in specific periods. The government, ruling and opposition parties, and the Federation of Korean Trade Unions agreed to revise the Trade Union and Labor Relation Adjustment Act in a back-door negotiation last December to prohibit companies from paying full-time union officials and allow multiple unions at the workplace-level with many restrictions posed on their right to bargain. The KCTU Central Executive Committee remains firm against the revision and committed to its re-amendment. The Committee has reaffirmed that its participation in the Deliberation Council was aimed at maximizing negotiating power and rescinding the revised laws. The powerful massive struggle will back up the negotiation processes. The KCTU will hold a rally that will be attended by about 10,000 unionists on March 27. By April 20, the Federation plans to complete its preparation for a general strike, which is scheduled to take place in late April. Moreover, beyond fighting for wage increase of union members, the KCTU will unfold a nation-wide wage struggle for a minimum wage increase and other measures so that all people can secure basic rights to live. We will judge the Lee government and the ruling Grand National Party at the local election in June. Across the nation, people aspire to judge the current government and the ruling party. The coming local election in June will be the judgment day. The KCTU will focus our resource to meet the nation-wide aspiration. We strongly believe that it is our mission to deal a blow to the ruling party in the election. In that sense, we will play a central role in gathering all democratic, progressive forces through solidarity, coalition, unity and integration. We will Organize People’s Action to counteract G20 in November. The Seoul G20 Summit in November should be a stage for people and workers around the world to express their indignation about the unfairness of globalization, not a ceremony to celebrate governments’ achievements. G20 is an antiquated attempt to return to neo-liberalism in an era of crisis it has brought about. 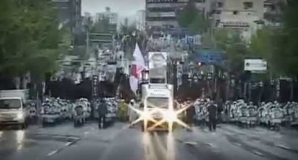 Koreans refuse to be spectators to this ceremony. During the G20 period, the KCTU will do everything in our power to stage a massive anti-neo liberalism struggle that will gain attention of people and workers around the globe. To this end, we will prepare to hold People’s Action and be a leader of a great transformation. Government turnover in 2012 is an important mission to KCTU. [Affiliates’ News] Korea Federation of Public Services & Transportation Workers Union (KPTU). Oppression against the Korean Railway Workers' Union for their strike last year is still ongoing. Despite the withdrawal of the strike, employer Korea Railroad (Korail) announced to complete the reprimand of around 11,000 strike participants within this month. As of late last month (February), 193 union officials and other union members were fired and dismissed. In addition, a total of some 7,400 were punished (suspension from the office: 435, wage cut: some 6000, rebuke: some 800). Korail filed a lawsuit against the trade union and union members for damages of $765 million. On March 5, over 300 members of the Korean Transport Workers’ Union, including Asiana Airline workers, held a rally to denounce Kumho Group and its affiliate Asiana Airline for their neglecting labor unions and transferring the results of lax management to workers. In 2009 collective bargaining, the Asiana Airline trade union demanded the employer to increase wage at a reasonable level and to stop the union oppression. Workers showed respect to management’s opinion and waited until this year; however, management totally ignored the union and excluded its members from being promoted. Moreover, the Asiana Airline unilaterally ordered union representatives to return to work. In commemoration of the 102nd Women’s Day the 2010 Care Workers Rally' took place in March 6 at the center of Seoul. More than 300 participants consisting of long-term care workers, sick nurses, preschool teachers and guide helpers gathered and argued that public, non-profit organizations run the long-term care services, not private ones. The Korean Government Employees’ Union indicted the Labor Minister for abuse of authority on March 9 after he refused the register of the union twice. The union also filed a lawsuit in the Seoul Administrative Court to cancel the Ministry’s refusal to register of the union. The public workers’ union said that it had revised its union rules pursuant to status of union member, which the Ministry had ordered to modify, and conformed to Ministry directives. However, the union said, the Ministry declined the register once again. The union added this was illegal, infringing on the union’s autonomy and violating its right to unite. The Labor Ministry returned the KGEU’s establishment report because the union guaranteed dismissed workers union membership and some provisions in the union rules did not conform to relevant laws last December. In March 3, the second report was returned in that the union was suspicious of having dismissed workers retaining their union membership. President of the Korea Construction Workers’ Union (KCWU) Kim Geum-cheol staged a press conference on March 9 to announce a strong protest against the government that takes oppressive policies on labor unions and denies them the right to unite. The KCWU has acted as a legal entity for more than three years after it received a trade union certificate from the Labor Ministry. To date, the union has even officially discussed several issues with the government. The union has also been subject to the Trade Unions and Labor Relations Adjustment Act and the arbitration of the Labor Relations Commission and Labor Ministry. In addition, collective agreements with construction companies have been, and are now being, concluded in countless construction sites across the country. However, the government has questioned the membership of dump truck, ready-mixed concrete truck and excavator drivers since last year. Eventually, the government declined to consider Kim Guem-cheol as a legitimate representative for the union, who was directly elected president by some 20,000 union members. With these measures, the government has made union registration system run on a de-facto permission basis, which constitutes a serious political threat to trade unions by infringing on union’s right to unite. Along with the KCWU, the Transport Workers’ Union has suffered repression. Moreover, the KGEU has been denied of registration three times and anti-democratic government policies have wiped out people’s basic rights throughout the society. These incidents clearly show the true intention of the government’s anti-labor measures. The KCWU has already started to prepare for a general strike scheduled in late April. We will hold union representatives’ meeting in March and its officials will unfold various campaigns. By doing so, we will win the rights we deserve.